Detective Slowpoke is a previously undisclosed government experiment, the hideous result of DNA splicing between a human and the entirety of the band A Ha. 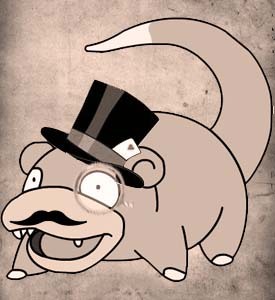 Detective Slowpoke is trying to understand our language by being exposed to the worst possible instances of it, in addition to slowly learning that life is okay. What tнē βLϵϵp D̄өn’t ωΣ (k)πow! ?Trust Me, I’m Not A DoctorClopping A FeelEC’s Magickal Mystyree TourSissy Kiss of DeathYou’ve Got a Friend In YouThe Only Trustworthy PodcastBeta Bux & Stupid FucksWhat Is Normal?Christmas in July SPECTACULAR! EC’s Magickal Mystyree TourWhat Is Normal? wikiHow to Shamelessly Appeal to Boots RaingearChristmas in July SPECTACULAR!